The waters from the shoreline of Vourvoulos Beach are turquoise in color. The location is 7 km northeast of Fira. One of the least used beaches in the area, it is a great place for privacy. The village, Karterados, is a beautiful area for exploring the local culture. Because of forceful winds and gigantic waves, it is recommended to stay a close distance from the shoreline. 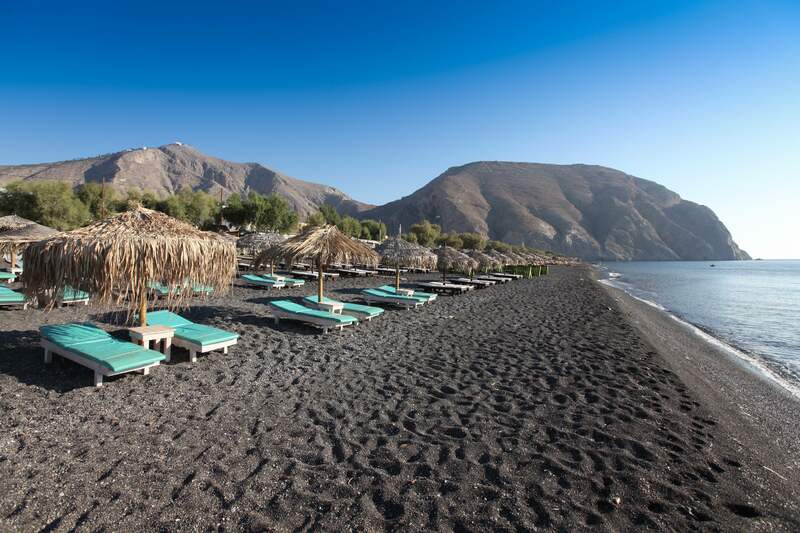 Popular to the local community and families, this beach is close to the Santorini airport. It is located 7 km east of Fira. The beach goes on for miles, the sand is black, and the water is shallow from the shoreline making it great for young children to play. This beach offers umbrellas and sunbeds to enjoy. There are various restaurants, hotels, café’s, and even a basketball court for the kids. 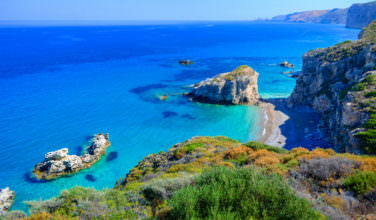 Located on the south side of the island, Vlychada Beach is 10 km south of Fira. The dark grey sand and yellow rock formations make this beach distinct from the rest. The ocean becomes deep very quickly from the shoreline. There is a local tavern which rents umbrellas and sunbeds to tourists and sunbathers. There is a small port used for fishing boats and yachts in the summer. Located 18 km southeast of Fira, Perivolos is very close to Perissa Beach. The waters are known for their sparkling blue color. Many of the restaurants, taverns, and café’s serve the local food of fresh fish and other popular dishes. The atmosphere is calm and relaxing with plenty of transportation available. Water sports, such as scuba diving, wind surfing, and jet skiing are available. 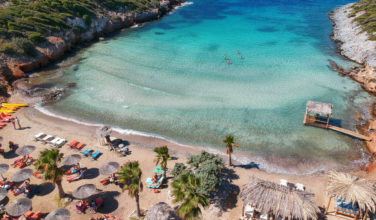 The tourist season for Perissa Beach begins mid-summer. Located 15 km southeast of Fira, there are plenty of hotels, cafes, bars, and restaurants to enjoy during your stay. The main attraction of Perissa is the giant rock that shines so beautifully at night, Mesa Vouno. Excursions can be made by foot or by donkey to the ruins of Ancient Thera. A popular beach resort, Kamari is 10 km southeast of Fira. The resort offers entertainment and luxury items such as water sports, umbrellas, and sunbeds. The beach has black sand and a gigantic rock, called Mesa Vouno, which emerges from the ocean floor and shines at night. 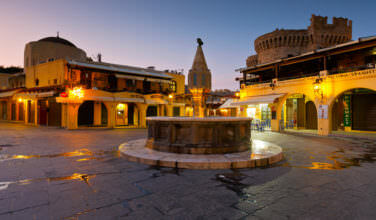 There are plenty of restaurants, café’s, shopping, and night clubs to enjoy. Ancient Thira is just up the mountain road, where you can visit the island of Anafi. While visiting Santorini, you won’t want to miss the chance to visit these beaches! There are plenty of accommodations and sight sightseeing opportunities for the entire family to experience.